RTL mode (Return To Launch mode) navigates Copter from its current position to hover above the home position. The behavior of RTL mode can be controlled by several adjustable parameters. This page describes how to use and customize RTL mode. 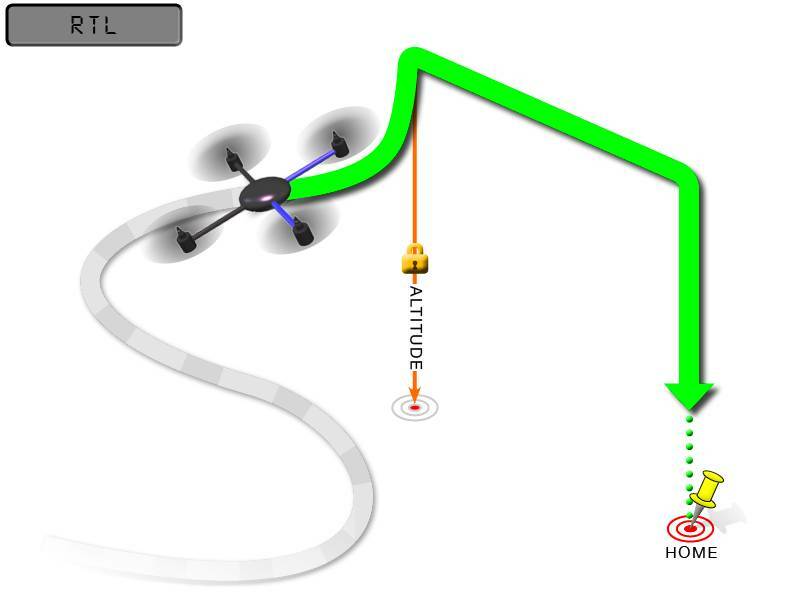 When RTL mode is selected, the copter will return to the home location. The copter will first rise to RTL_ALT before returning home or maintain the current altitude if the current altitude is higher than RTL_ALT. The default value for RTL_ALT is 15m. RTL is a GPS-dependent move, so it is essential that GPS lock is acquired before attempting to use this mode. Before arming, ensure that the APM’s blue LED is solid and not blinking. For a GPS without compass, the LED will be solid blue when GPS lock is acquired. For the GPS+Compass module, the LED will be blinking blue when GPS is locked. RTL will command the copter to return to the home position, meaning that it will return to the location where it was armed. Therefore, the home position is always supposed to be your copter’s actual GPS takeoff location, unobstructed and away from people. For Copter if you get GPS lock and then ARM your copter, the home position is the location the copter was in when it was armed. This means if you execute an RTL in Copter, it will return to the location where it was armed. In RTL mode the flight controller uses a barometer which measures air pressure as the primary means for determining altitude (“Pressure Altitude”) and if the air pressure is changing in your flight area, the copter will follow the air pressure change rather than actual altitude (unless you are within 20 feet of the ground and have SONAR installed and enabled). RTL_ALT: The minimum altitude the copter will move to before returning to launch. Set to zero to return at the current altitude. The return altitude can be set from 1 to 8000 centimeters. RTL_ALT_FINAL: The altitude the copter will move to at the final stage of “Returning to Launch” or after completing a Mission. Set to zero to automatically land the copter. The final return altitude may be adjusted from 0 to 1000 centimeters. RTL_LOIT_TIME: Time in milliseconds to hover/pause above the “Home” position before beginning final descent. The “Loiter” time may be adjusted from 0 to 60,000 milliseconds. WP_YAW_BEHAVIOR: Sets how the autopilot controls the “Yaw” during Missions and RTL. 0 = Never change Yaw. 1 = Face Next Waypoint including facing home during RTL. LAND_SPEED: The descent speed for the final stage of landing in centimeters per second. The landing speed is adjustable from 20 to 200 centimeters per second. To use RTL, GPS lock needs to be achieved (Blue GPS LED and Blue APM LED on solid not blinking) before arming and takeoff to establish the home or launch position. Landing and re-arming the copter will reset home, which is a great feature for flying at airfields. If you get lock for the first time while flying, your home will be set at the location of lock. If you set the RTL_ALT to a number at other than 0 it will go to and maintain that altitude while returning. RTL uses WPNAV_SPEED to determine how fast it travels. Once the copter arrives at the home location the copter will pause for RTL_LOIT_TIME miliseconds, timeout (AUTO_LAND), then land.